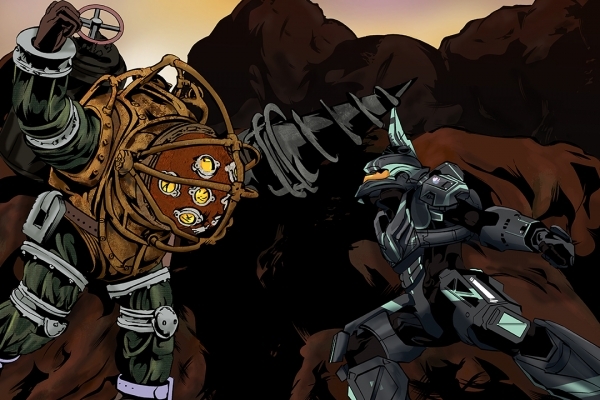 A Commissioned Art piece, Big Daddy vs Halo Spartan. Two powerhouses going up against one another. Like all little Kids I Drew as a Kid I just never grew out of it. I took as many Art Classes as I could growing up, and even Went to the Joe kubert school for a few years. As much References as possible. More than one angle is the best. Size 10X15 Digital. Prices: full colored two figures light Background Price $65 Lightly colored two figures colored two figure light Background $55 Gray scaled two full colored two figure light Background $50 Line art two figures colored two figure light Background $45 Size Drawing/Digital 8X10 Lightly colored two figures colored two figure light Background $35 Line art two figures colored two figure light Background $25 Paintings: 12X9 $80 minimum and the Price of supplies $5 for any extra figure. or Heavier background. Commissions can take up to two weeks. Delivery Time: Digital Work, unsigned Instant Non Digital work/Digital work Signed, week from Completion and additional $5 Dollars for shipping/Printing fee. Prices stand for personal Commissions only. Any commercial work Prices need to be adjusted to the Project.